Public relations is often castigated as being about spinning words. And fairly, in some cases. Hopefully only a few. But with PR catching on to the power of data, too often it’s the numbers that are being spun (albeit inadvertently in most cases, I reckon). This series of posts covers some of the pitfalls to watch out for. A lot of visualisations are of a simple image – a circle, a lightbulb, a square, or even a pig! And it leads to one of the most common mistakes in visualising data through the perception of scale. 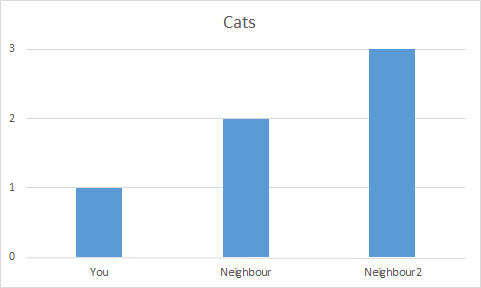 How about a simple bar chart? A little more interesting – but still pretty dull. Ignore my lack of artistic skills! 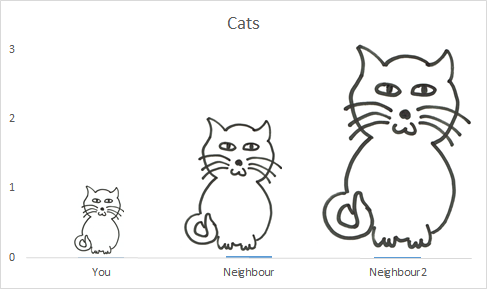 Each kitty is the same height as the bar it replaces. 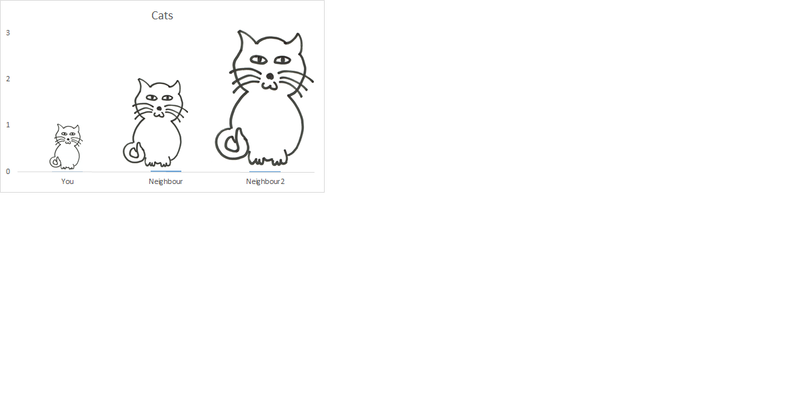 But the neighbours’ cats look a bit poorly. But we have a problem. 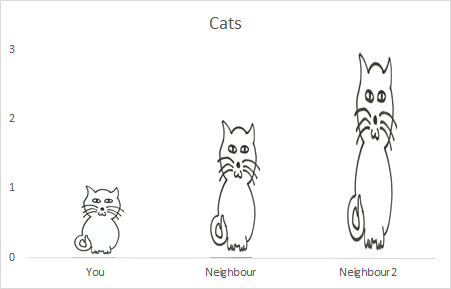 At first glance, Neighbour2 seems to dominate the world of feline ownership. It’s down to how our brains perceive area over the single dimensions of height and width. If you double the height and double the width to keep the proportions, the area quadruples. In other words, the area goes up by a power of 2; triple the height, triple the width and the area is nine times as big! I see this kind of problem nearly every day. An example is below. You need to check the numbers to really understand what’s going on – and that defeats the purpose of the visualisation (or wrongly exaggerates what message your audience might take away). 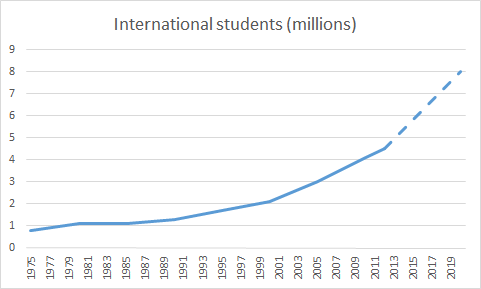 The figure projected for 2025 is ten times that of 1975. But the circle with the dotted line absolutely dwarfs the 1975 circle. If anything, the brain now ‘underperceives’ the projected ten-fold increase. Even the government’s own chief scientific adviser isn’t immune to these issues, which you can read about here: A tale of two piggies – area matters even for the Chief Scientific Adviser. Next Next post: Adverts and percentages – is statistical beauty only skin deep?